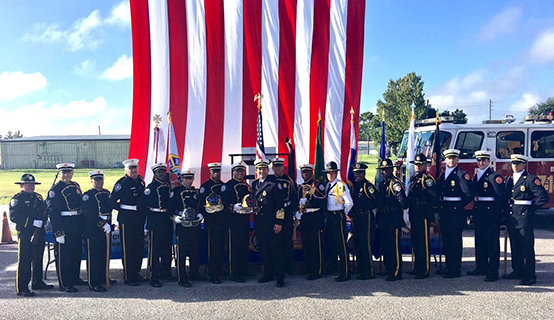 In honor of the 15th anniversary of 9/11, Orange County Fire Rescue held its fourth annual 343 Hero Challenge fitness competition on Sept. 17 at Orange County Fire Rescue’s Training Facility, also known as the Fit Pit. The charitable event brought together firefighters, athletes, vendors and spectators in honor of the 343 fallen firefighters of 9/11. The annual 343 Hero Challenge event includes a mix of strenuous firefighting exercises and challenging CrossFit-style movements. One of the highlights of the day is the trademark 343 Hero Challenge, a simulation designed for competitors to experience a small glimpse of what it felt like climbing the Twin Towers on 9/11. Participants suited up in firefighter bunker coats with air packs, carried hoses and completed three minutes and 43 seconds of step-ups while viewing an impactful image from the 9/11 tragedy. A variety of vendors attended to support the cause and raise money for the Firefighter Cancer Support Network. For more information about Orange County Fire Rescue, as well as emergency and safety information, visit www.ocfrd.com or contact Public Information Officer Kat Kennedy, (407) 836-9074.